High-energy flowing water habitats such as waterfalls are uncommon in Antarctica, though they may become more regular as temperature increase. Both high spatial and temporal environmental variability is expected on them. The extent of their biological colonization will depend on the amount of ecological strategies displayed by the surrounding biota. We report here a study on phototrophic microbenthic communities inhabiting such environment in a stream on the Byers Peninsula of Livingston Island. Five different biofilms were distinguished by colour, and were located in specific microhabitat types in the waterfall, which flowed down a steep canyon. Photosynthetic pigment content and microscopic observations demonstrated a different assemblage of chlorophytes, cyanobacteria and diatoms among them. Biofilms were not randomly distributed in the stream channel, which may be related to water flow, nutrient availability and moisture. The exopolymeric substances content, stoichiometry and pigment composition varied among biofilms, likely reflecting differences in the water and nutrients availability. The photosynthetic rates were in the range of the observed in previous studies in the site and varied according to the habitat within the stream. Communities dominated by chlorophytes were restricted to the central channel, suggesting adaptation to faster flow regime. However, cyanobacterial biofilms appeared in a great range of environmental conditions. They were rare in the central channel where water flow was greatest, but achieved large biomass stocks on submerged and even exposed sites in the splash zone at the edge of the flowing water. 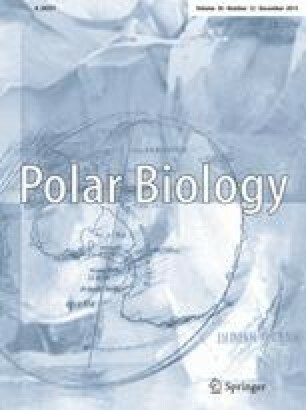 This study shows how Antarctic biofilms can have a large variability in community structure and biomass over short length scales, reflecting the range of microhabitats in this Antarctic waterfall ecosystem, and the potential occurrence of different strategies to overcome fluctuating conditions. Fieldwork was supported by grant REN2000-0435-ANT from the Science and Technology Ministry (Spain) to AQ. Sample processing was supported by grant CGL2005-06549-C02-02/ANT from the Spanish Ministry of Education and Science to AC, which was co-financed by European FEDER funds. We are very thankful to the UTM (Maritime Technology Unit, CSIC) and Las Palmas crew (Spanish Navy) who provided us with the logistical support to make possible this expedition. We also acknowledge the constructive comments of the reviewers.